There’s nothing quite like a flaky, buttermilk biscuit paired with jam, honey, maple syrup, or butter to send your taste buds into overdrive. What better way to celebrate a long-standing Southern tradition than by commemorating National Buttermilk Biscuit Day on May 14? These flakey, carby treats emerged in the pre-Civil War era as an inexpensive addition to meals. When people realized these robust bread products absorbed the gravy on their plates better than plain bread, biscuits soared in popularity and the version that we all know and love — the buttermilk biscuit — was born. From celebrating at your favorite restaurant to whipping up a gourmet batch at home, there are ample ways one can pay homage to this Southern staple. Rule #1: You can never have too many biscuits. In preparation for the holiday, scope out the local restaurant scene a few days beforehand to discover what kind of deals you can find. Then, on May 14, put your game face on and head over to your local Cracker Barrel to enjoy some home-style cooking, complete with mouthwatering buttermilk biscuits and flavorsome gravy. For dessert, mosey on over to Red Lobster to scarf down copious amounts of their legendary (and addictive) cheddar biscuits. Popeyes, Bojangles’, and Church’s Chicken also have tasty biscuits. Remember, the earlier you start , the more ground you’ll cover. Nothing, and I mean nothing, beats homemade buttermilk biscuits. If you aren’t sure where to start, there are hundreds (give or take) of recipes floating across the Internet at this very second. If you’re feeling adventurous, make up your own recipe! We’ll give you a hint: you’ll probably need buttermilk. As wonderful as buttermilk biscuits might be on their own, they can often be made even better when combined with other awesome ingredients. From exotic casseroles to scrumptious cinnamon rolls, there are heaps of unique dishes that can be made using buttermilk biscuits as a base. Get creative — the possibilities are truly endless! One of the greatest things about the buttermilk biscuit is its versatility. 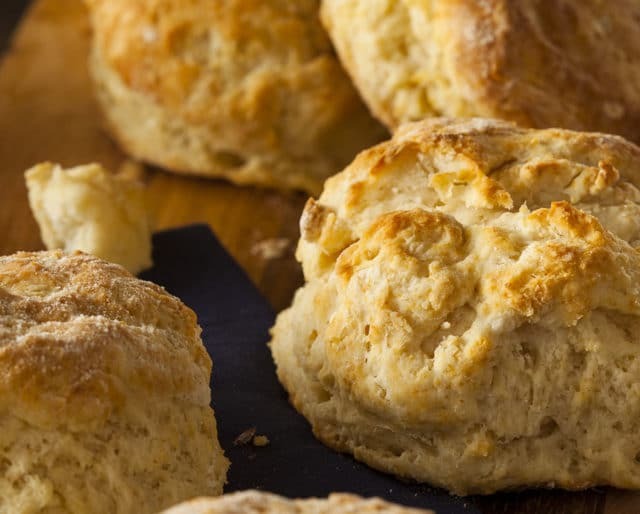 Whether you enjoy your biscuits immersed in gravy or prefer to order them with the traditional brunch fare, buttermilk biscuits can be served as an accouterment for any meal. Feeling extra hungry when lunch rolls around? Skip the line at your usual joint and pop a couple of biscuits in the microwave. Problem solved! Everything tastes good on them. From molasses to fruit-flavored jellies, there isn’t much you can’t put on a buttermilk biscuit. Throw a little bacon, egg, and cheese on top and you’ve got yourself a gourmet breakfast. Heck, you can even slather them in peanut butter if traditional isn’t your thing. Use National Buttermilk Biscuit Day as an excuse to experiment with your favorite condiments. They’re a classic comfort food. Buttermilk biscuits are a universal comfort food, no matter which geographical region you grew up in. Of course, if you were raised in a good ol’ southern home, you probably have a special type of appreciation for them. Regardless, what’s not to love? There’s just something about biting into an ooey gooey buttery biscuit that is incredibly therapeutic.